What? What the heck does that mean? Is that for real? Yes, it is. Martell and his wife Courtney have donated money to a Chimpanzee sanctuary in Bend, Oregon run by their friend (Chimps Inc), earning the title of Chimpanzee Benefactor. For just a $1,000 donation you too can have this title, and the benefits that come with it including a private tour with the chimps. This donation helps feed one of their chimps for a month. 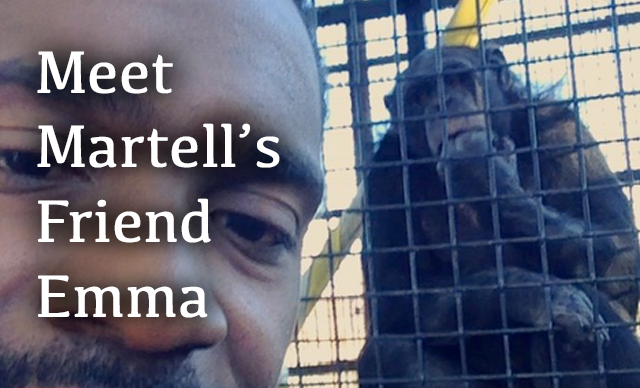 Here's Martell with one of the chimps, his new friend Emma. With Martell talking to the animal like it is a baby. You can check out more info on this sanctuary here.